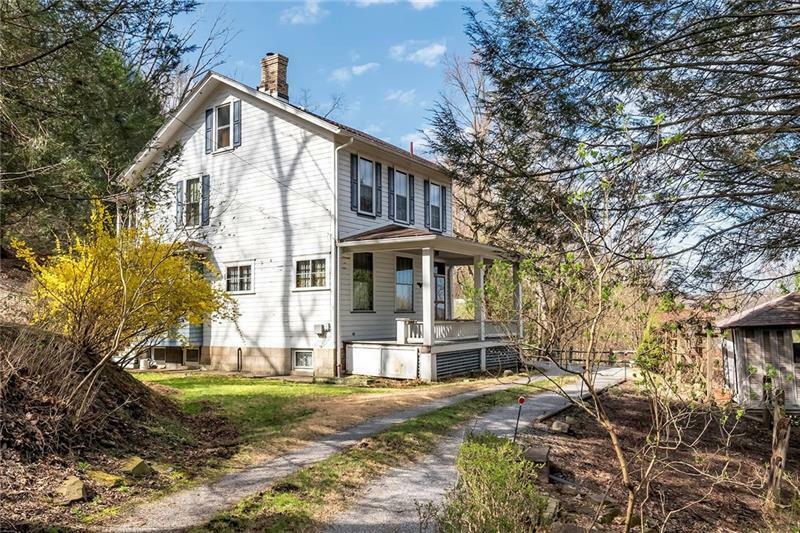 Charming Farmhouse on a Private Wooded Lot Minutes to the Sewickley Village Shops, Restaurants & Area Schools. Amazing Woodwork, High Ceilings on the First Floor, Built-In Cupboards & Three Porches Give This Home Wonderful Potential. Kitchen Galleria Natural Cherry Eat-In Kitchen with Adjacent Butler's Pantry for Added Storage. Stunning Built-In Window Seat in the Dining Room That Originally Came from an Older Sewickley Heights Estate. Spacious Living Room w/Woodburner Fireplace & Gorgeous French Doors to the Foyer. Spacious Master Bedroom w/Two Closets, Wood Flooring & Original Tile Fireplace Surround. Full Bath w/a Clawfoot Tub & Newer Pedestal Sink. Two Additional Children's/Guest Bedrooms on the Second Floor w/Wood Flooring. One of the Two Has Access Via French Doors to the Sunporch. Third Floor Has Endless Possibilities as a 4th Bedroom, Children's Playspace or Home Office. Don't Miss the Spacious Front Porch for Entertaining & Shed Across the Driveway for Added Storage.